Just before the Gettin’ Sauced event, I stopped in again at Franklin Barbecue to try the ribs and pulled pork. I knew the brisket was stellar from previous visits (I stole a bite or two from the Patron Saint on this trip too), so I wanted to check on the other meats. The ribs were just as good as the first visit. A well-formed bark was covered with a rub heavy in black pepper. The meat came easily from the bone with just a little tooth tug, and the flavor was incredible. The pulled pork equaled the ribs in flavor. The mixture of moist fat, smoky bark, and tender meat came together for a taste explosion. This was some of the best pork I’ve eaten. It seems there’s nothing Aaron Franklin hasn’t mastered. 01/2010: I stopped in at Franklin Barbecue on my way back from San Antonio one Sunday morning about a month ago. I’m just now getting to write about it, but the flavor of that brisket lingers in my mind still. It was 10:45 when I stepped up to the locked chain link gate and Aaron, the owner, was arranging picnic tables in the front, getting ready for his eleven o’clock opening bell. I sat there like a sad puppy dog until he unlocked the gate and happily invited me in for a few slices off the brisket he was just pulling from the pit. We chatted for a bit as he unwrapped and sliced the meat, but I cut the conversation short knowing he had to get back to work, and I had to have some alone time with this beautiful beef in my front seat (too cold for picnic tables). I took a few bites, and the flavor was incredible. I had ordered the fatty cut on my previous visit, but lean cuts are more suited for brunch. The heavy black-pepper rub helped create a crispy crust on the meat that also packed a wallop of smoke. Although this was lean brisket, the meat was incredibly moist and perfectly tender. After a few luxurious slices, I wrapped it back up and headed out onto Interstate 35 back to Dallas. 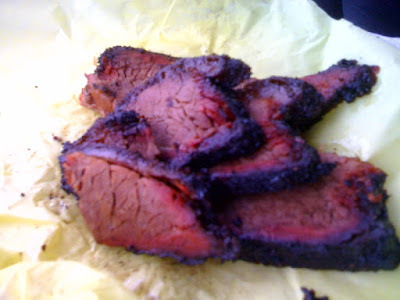 As the radio played, I contemplated if this was the finest brisket that I’ve ever eaten as it called to me beneath the thin, greasy, and now transparent yellow paper. As I eyed the interstate with one eye, the other was watching as I carefully unwrapped the meat for another go. As the salty flesh passed my lips, I realized how an appropriate song can add so much to a special moment. Now there are songs with a manufactured timeliness, like playing Brad Paisley’s “Alcohol” during an all-night kegger. Of course it fits when everyone’s already consuming the item in the title. But then there’s the true timeliness of a song that you hear as you’re driving in the car, after suffering through years of mediocre smoked beef, and a perfect sugar cookie from a perfect slice of brisket melts on your tongue, and, as it traces down your throat, you hear Eddie Money shout “I think I’m in love!” That’s timeliness.